The Castrol Rankings answer a fundamental footballing question – who is the best footballer of the last 12 months? The Rankings uses the objective measures of statistics to provide this answer, and as objective analysis goes, it tends to provoke a sharp reaction amongst football fans. Everyone has their favourites, people are quick to judge recent performances (hence the surprise registered at Wayne Rooney’s presence in the Top 5 or Frank Lampard’s in the Top 10) and ultimately, when people don’t understand the statistical basis behind any set of calculations they are likely to mistrust it. I was pretty much in the same boat when the Rankings first came out, but soon curiosity got the better of me, and I had to find out exactly how they determined that Messi was better than Ronaldo or that Lucas Barrios (Borussia Dortmund) is rated ahead of Didier Drogba, Diego Forlan, David Villa and Diego Milito, just to name a few. Every player in the top five leagues in Europe: The English Premier League, Spain’s La Liga, Italy’s Serie A, the German Bundesliga and France’s Ligue Une as well as the UEFA Champions League. Castrol Performance Analysts use more than 50,000 scores from domestic and European matches to generate a team strength rating for each club in Europe. The weightings reflect the average team strength in that tournament. At the end of the football season, the weightings are adjusted accordingly to reflect the strength of each domestic league. How often are the Castrol Rankings updated? The Castrol Rankings are a rolling ranking system which looks at the last 12 months e.g. 1st November 2009 – 31st October 2010. The Castrol Rankings are made available each month via www.castrolfootball.com. Castrol uses data provided by OPTA, Europe’s leading provider of sports performance data, to create the Castrol Rankings. Any model based on statistics has some assumptions. In Castrol Rankings, the core assumption is that analysing a game through pure statistics gives you a reasonably accurate view of how well players perform over a period of time. The secondary assumption is that because you’re looking at the numbers in a scalable, neutral fashion, it’s impossible to factor in individual details / modifiers to cater for specific match situations that statistics themselves do not reveal. The Castrol Rankings also do not take into account international fixtures and therefore don’t factor in the World Cup, which tends to weigh heavily on peoples’ opinions when determining the ‘best player’. Despite that, if you’re looking for the best ‘performer’ in domestic football in Europe, you’d be hard-pressed to find a better statistical model to rate players. Of course experts tend to disagree. Not many would argue against Messi or Ronaldo being at the top of the rankings, but what about Xavi (ranked 25th overall and the 6th best Barcelona player, behind Alves, Pique and Puyol)? What about Fabregas (ranked behind Arshavin as the 2nd best Arsenal player of the last 12 months)? Speaking of Arsenal, is Almunia really the 7th best Arsenal player? The trouble with ‘expert’ opinion is that we tend to confuse ability with performances (and sometimes vice-versa). When we see any form of rankings we invariably take it to be a suggestion that so and so is better than so and so. On the contrary – the Castrol Rankings are very clear on the fact that they are measuring player performances, not player ability or quality. With that in mind, the debate turns to how one evaluates performances and weighs statistics, and not on whether Xavi is better than Ronaldo (he may or may not be, but Ronaldo has definitely out-performed Xavi in domestic football in the last 12 months). It also brings to mind the issue of how great players can be lifted or subdued by their teams. Rooney’s standout performances would not have come about if Manchester United didn’t rely on him to do all the goalscoring last season, and Xavi’s brilliance is tempered by the goalscoring exploits of Messi and Villa, plus the positive impact Barcelona’s style of play has on the statistics of their back four. Numbers may not tell the whole story, but then again no one / nothing does. What they do is provide you with a factual basis for who has performed best / delivered the most value on the pitch. The Castrol Rankings measure quality by results, not by wishful thinking. Regardless of how much I’d like to see Cristiano Ronaldo ahead of Lionel Messi, the fact remains that we’ll have to wait for him to prove it on the pitch all over again. 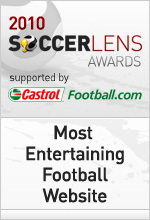 Castrol are proud sponsors of the 2010 Soccerlens Awards. Learn more about the Castrol Rankings Widget, which allows you to filter the Rankings by team, league, nationality and position but it can also be embedded in any blog to create the specific data you’d like to use or share as a widget on your site. This dynamic widget offers you unique content to drive debate; giving you and your readers new insight and talking points on the game. You can see the widgets in action on Soccerlens.com. To download the Castrol Rankings widget for your site or blog visit www.castrolfootball.com/widgets.